You can’t base power percents on GP , that is not the metric used to determine your opponents. From the time I got into Galactic War back in April of 2018 until at least September of 2018, The toughest battles were always 6, 9, 11, 12. Battle 1, 2, 4, 5, and 7 were usually laughable. Battles 3, 8, and 10 were on par between the tough set and the easy set. From the time I got my roster set for GW(many chars and teams to choose from) in May/June until September of 2018, there was never any team on any node more than 15-20% more GP than my top 5 characters. I had several accounts across my phone, tablet, PC, and it was the same across the board. I also have two of my sons and a wife who plays, but one son just started playing in the last month. They have the same experience. Similar experience to me up until a month or so ago. I don't know what method the game uses to determine what team it pits against you on what node, I just know that something changed a month or so ago. Unless we were extremely lucky getting teams that fit what the GW guides were saying would happen for 5ish months across hundreds of GW completions over several accounts. I think you're onto something. I've been playing about 3 weeks now, so can't really say. But the nodes that everyone mentions as difficult nodes, have not been really unbeatable. It's weird nodes like 2 and 4 or somethings even 1. I understand if I get to the last node and it's an unplayable team, that happens every so often. But the really tough teams on node 2?? That is weird. When I talk tough, I am L65, got one toon to G8 the rest at G7, and they pit me against an Empire squad with Thrawn, gear 10 and 11 and L82 and all of them 7* - that on Node 2. That's just wrong. But, like I said, I'm not letting it get me down. I just share my screenshots of the ridiculous teams with my guild and we have a good laugh at it. Most of them, way more experience, tell me to run. afer starting game 3 months ago i have been able to finish GW 2 times now. I just started playing very recently. Only L56. I've been having fun. Galactic war is cool. I finished it a few times but in the last 3-4 attempts I get faces with incredibly high level teams. Right now I'm stuck at node 2 against a full L85 team. It's a wall. There is absolutely nothing I can do against a team like this. How is it a good design if on one day I can finish the war and the next I get completly one shotted at node 2? It really feels buggy to me. There something off with the design here. My team is all below 4 star no purple gear as im not high enough level. How are you ment to compete with teams that 1 shot you and get the first go. 3 of your team are dead before you got a turn. The last nodes are supposed to be hard, and you should expect to encounter teams with significantly higher power than your best 5 combined. The second and 3rd time i never got past the first section because the teams im facing are 15-22 levels higher then me and one shot any squad i put up. If its keeps happening like this so very unfair ill be refunding every cent i spent to date. Happened again. Stuck on node 3. Sent all my squads keeping my best (Pheonix) for last and not even close. The level/power difference is too pronounced. Oh well, it is what it is. Not very welcoming for new players. It happens occasionally while you're leveling. Once you hit 85 and have really started to invest in a team, you'll snooze through it 100 more times and finally unlock the ability to just sim it. The most important in GW is to keep a balanced roster. Don't have a single OP squad and the rest at low level. You need a minimum of 3 goods squads and some cannon food in between. Throw a squad of paper toons to draw the specials then use your goods ones. Try to manage your cool downs. Don't Lv Up if you don't have the gear. I kept my entire roster at G10 max until I was able to sim it. It is worth it since GW is your biggest source of $ at the beginning. It's been very long an frustrating for me as well, I'm so glad I'm done with that. I remember getting an immortal Rogue 1 Squad on the very first node about a year ago and it almost made me quit... Looks like it's getting worst now with all the new toons. Good Luck ! They must be punishing u for never playing they must use a time u start to calculate ur opponents based on where u should be if u played on lvl others would be( top players in ur arena) I’ll be 3 months in like a week or so but my arena team is 72k the usually throw teams 18k more power and as of late it’s been straight NS. I have been getting through just lost cause they throw 2 back to back 1st less power and I was chilling let my tank health drop to low and couldn’t finish last one. Maybe could without tank could have dropped 2 or 3 max didn’t close our app in time and my team die that was it. My back up can’t take full line up no matter the combinations. This just made me chuckle. Im 84 with a decent jedi team and a phoenix team. I know everyone says GW is supposed to test your entire roster etc, but I could throw all 10 of my best chars at this team and it hit it like a wet noodle. Ugh that 150 gw win seems so far away when this is my 4th day in a row to not be able to complete it. Completed it 5 days ago but only after 2 more days of the same thing. This team had 3 Zetas and a gold ob. Sheesh how discouraging. Part of your problem here is your teams. At this level Phoenix are only good for early nodes and mop-up and your Bastilia squad is at a disadvantage in a mirror match with a superior Bastilia squad. Yeah i also just unlocked 7* ep and I have a decent Vader, so I'm currently working on building that team as well. It's just going to take some time. Yeah it takes a while but once you get that squad powered up you will be in good shape for GW. You just have to get better u run jedis probably bastila lead should be easy for u to beat another jedi team if they ever throw a empire squad my way I would be rubbing my hands but they never do because it’s meant to test u. U should have a zeta on ur bastila lead and they will keep throwing teams like this ur way until u beat them. They threw 2 NS back to back on me I beat them. The last NS team was 2 in a row haven’t seen them since they switch it up once u continue to beat them which u have to do so the practice will be good. U should get a zeta if u don’t already have one tomorrow and throw on ur bastila lead and if u still can’t be then need to really practice if u want to move up in arena will c many similar teams. The difficulty is ridiculous! My highest toon is lvl 82 7* Vader with gear 9. I only have three 7* mixed toons and paired with a max squad on second battle. Edit: there’s one lvl 73 toon, but my toons are no match for the other four toons. If you are seeing a lot of zeta Bastila Teams then a direct counter that’s relatively easy to build = Nightsisters. Come to think of it Nightsisters resurrections and heals would be a solid “extra” team for Galactic War. Team 2 is your suicide squad. Team 1,3,4 all synergise well and Regen Health/Protection. 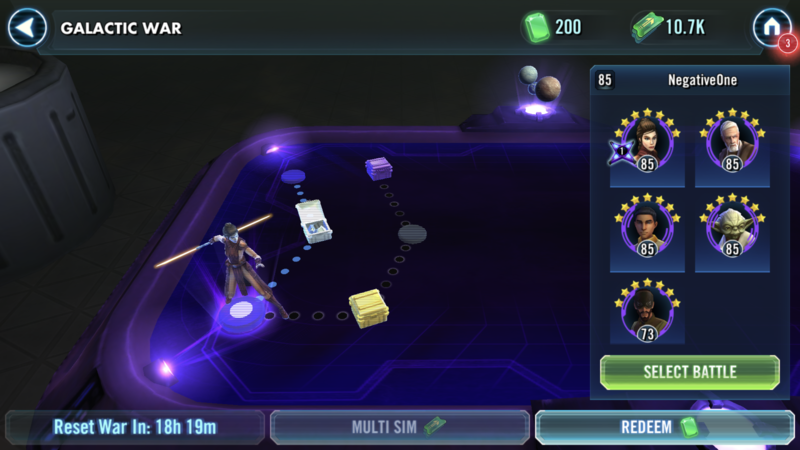 IF you find this isn’t enough then Nightsisters or Bastila Jedi are the next easiest teams to build and help. Come to think of it —> If you are building the core teams above which unlock EP, Thrawn, R2, CLS and let you finish the Credit Heist then GWar will solve itself. It’s not about having a “wide” roster it’s about having a balanced roster with synergy. The strat I used was build an arena team that can beat almost anything and put great mods on it. I use ep sith. And modded correctly it can beat traya, bastilla and revan. Then build a secondary team with health/protection regen. Pheonix works great for this but ns or bossk bh would also do well. Use the second team for everything but the hardest battles. Bring in the arena team as needed. This method takes time but not too bad as you really only need to focus on two teams and mod farming. You need to do that for arena anyway. Look at GW the same way you look at top 50 Arena teams. If there are tons of Trayas and Revans there, you will be facing them in GW as well. So work towards hard counters of those teams. And that means also planning ahead on your main team. If you use Jedi, I advise you to take a long hard look at specific zetas for the toons you use. For example, Jolee with high hp and protection that lasts long enough can resurrect your defeated jedi at 80% max hp, which works quite well if you use a team with Bastilla lead, two yodas and either Old Ben or General Kenobi as 5th. A good strategy always takes a lot of time and/or money and/or dedicated effort to build. But it feels good when you reap the benefits. Also in your specific case, note that Revan is relatively easy to get once you have collected the light side old republic heroes, just requires 3 zetas to unlock his full potential. Still, if you run Revan, Hermit Yoda, Grandmaster Yoda, Bastilla and Jolee you will enjoy how easy most things become for you, so it is something to work towards (I personally prefer a full sith team, Emperor Palpatine, Darth Vader, Darth Sion, Darth Nihilus and Fallen Bastilla are so much fun to use). I did manage to get past GW now for past 2 weeks every day. Thanks to getting Palpatine and Empire team enough power. My team power is 60000 and it can beat everyday Bastila/nightsisters/phoenix 70-80000. But after 4 months of grinding and collecting empire and rebels... i got there. And with rebels i worked Boba Fett to help with Credit heist. I had hitting that wall since beginnig and my rebel team got enough good to get palpatine 6*. Thats when everythig changed..
Yeah, that happens. Been a long while since I had to deal with it though. I might do a trip down memory lane and see how my current team goes against it. Yeah, I used to think that they were going to structure things so that the first 5 nodes were easy, node 6 might be a tough fight if not using a team with pre-loaded TM, but since your toons should have turn meter from a previous fight, you'd get some bonus attacks at the beginning and take care of them no problem. Then back to doable even without pre-loaded TM for a least one, maybe two nodes, then start escalating in difficulty. But that's not really how it works. On average node 6 is harder than node 3, but the algorithm simply can't deal with aspects like synergy, and even the things I can (theoretically) handle, like levels, it doesn't always handle well. So you get fights that have such a wide range of difficulty that even if it's true that on average node 6 is harder than node 3 is harder than node 1, in practice you rarely get a team that you can't beat with pre-loaded TM and several restarts and leave all 5 toons alive ... until you get one of those teams that simply destroys you, pre-loaded TM or not, restarts or not, leaving nothing but scorched earth behind. It would be interesting if there were more fights where winning cost you a toon or two, but in practice we simply don't get fights of that difficulty. We get fights we're expected to win with all 5 toons intact, and then we get impossible nodes where nothing works and you're done for the day. I don't like it, but I accept that they've probably tried to make it better, and even if they didn't try they're not going to be fixing it now. So it is what it is: some days you just won't complete it. The trick is knowing the difference between the squads you can beat with just the right RNG or just the right squad, [which makes it worth spending the time to try to juggle your choices and toons until you get through the first couple rounds of attacks and can start to take them down] and the squads you'll never beat with the toons you have [which makes any time spent trying wasted time better spent on a good book]. Now that the GW bug is fixed, GW is still pretty challenging but doable. I increasingly run into well-rounded Nightsister teams and Jedi teams with GM Yoda around my level (76), often with better gear than I have. I haven't unlocked him yet and my arena Jedi team only has gear 8. What saves me every time though is speed. Bastila and Ezra are around 190 and even slowpoke Kanan is at 171 speed. I can usually take out 1-2 key opponents before the other team gets a turn. Being able to quickly remove GM Yoda from the equation, or Old Daka and Talzin, or Ezra if you're facing a Phoenix team, makes an enormous difference. PS: My new favorite character is Vandor Chewbacca. For a supposed tank, he is a pretty capable healer and protection-buffing supporter. Throw in Captain Han Solo, and even undergeared scoundrels have a pretty good survival chance. I only geared them up a bit for the Training Droid Smuggling event, but they've proven very capable on easier GW nodes lately.